Elizabeth Hildreth‘s poems, translations, and essays have been published in Hayden’s Ferry Review, Bookslut, McSweeney’s, Parthenon West, Michigan Quarterly Review, and Forklift, Ohio, among other journals. She recently published Coses Petites (Little Things), a translation of a collaborative collection of poems by Catalan poets Anna Aguilar-Amat and Francesc Parcerisas. She is a member of Poems While You Wait, a group of poets who sit in public spaces with manual typewriters and compose poems for passers-by about any topic they request. We went Behind the Sestina with Hildreth to discuss her sestina, “In a Rut,” featured in The Incredible Sestina Anthology. 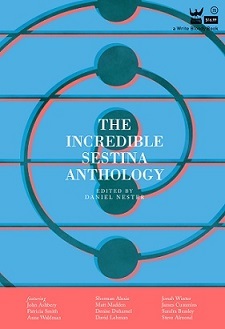 When did you first discover the sestina? Do you remember the first sestina you ever read? Could you tell us about that? What’s your favorite sestina? I can’t be sure, but I would guess I discovered the sestina in graduate school when I started looking at poems critically, trying to see how they were made, what they were doing. I don’t remember the first one I ever read. But I’ve always liked formal poems. I work as a designer, so I love constraints. Most people do, I suppose. On Top Chef, they give you a chicken wing and some cotton candy, and if you want to win, the judges better be eating some finger-licking edible poetry within the hour. Project Runway, same deal. Almost always, things made within absurd parameters are terrible. But every once in a while somebody gets it right. For instance, I hated villanelles. I couldn’t stand them. Then Martha Collins wrote “The Story We Know.” Well. I have friends who believe that there are no good sestinas. They can’t exist. That’s very motivating. As far as my favorite sestina? I like Jonah Winter’s “Bob.” It’s funny. Surprising. Tells a story, a musical one. All good things in my book. We know you have written other sestinas, and some collaborations as well. Where would you place this sestina in your sestina-writing life? What keeps you coming back? I’ve probably written an entire book of sestinas! And, yes, I’ve written collaborative ones, which is an interesting process. “If you don’t like what they’re saying, change the conversation.” Isn’t that the expression? Sestinas give you three chances to do that, maybe four or five, depending on how you divide the work in the envoi.This particular sestina wasn’t a collaboration, but it was written for someone. I think I keep coming back to the sestina because I’m attracted to its obsessive circling for truth. Steven Dixon’s novel Interstate is compelling to me for the same reason. The story’s inciting event never changes, but in each retelling (8 of them), characters and plot points are added or subtracted. The story actually ends up feeling more true with all the repetition and the variant retellings. It’s similar to memory, that impulse to return to a scene of conflict to attempt to make it “right” or make sense of it. Can you walk us through the composition of this sestina? The poem is called “In a Rut”—were you, in fact, in a rut when writing this? Other than the topic and end-words, I didn’t have one idea in my brain. I don’t have any preconceived ideas about what I’m going to say when I write poetry. When I first started composing on my computer, I found myself being neurotic and deleting every line. I figured the way I was going, it might take the rest of my life to finish, so I lugged a giant green Remington manual typewriter, a book of quotes, and an American Heritage dictionary into my kids’ room, dumped everything on the bed, and shut the door. I started writing at around 7:30 in the morning and worked straight through until I finished a draft at about 4 in the afternoon. The next day I revised. Then the next day I revised again. Then it was done, or done enough. I love how the poem turns hopeful toward the end–I am a sentimentalist, so that’s how I read it. When I read “it is okay: boredom, repetition, failure,” I feel that much less miserable. Was that your intent, or does the poem’s speaker have something else in mind? I am such a sentimentalist. I think it’s great if anyone feels less miserable after reading a poem. I can’t claim to have had any “intent” as a writer, but, yes, I agree, the poem’s speaker is very optimistic. It is okay. That’s my read, too. Finally, the first sestinas were always dedicated to someone—yours is dedicated to EP, who is even named, “Ep,” in the envoi. Care to elaborate? EP is Eric Platter, a poet and a friend of mine. We’re both in this poetry group called Poems While You Wait. We go into public spaces and write commissioned poems for people for $5 a poem. People write down a topic for us, and we write them a poem on that topic while they wait. Sometimes the topic is general—“spring” and sometimes it’s specific—“the difficulty of finding love when you’re in your 30s and live in the city.” So I asked Eric for a topic and six end words, sort of like an extension of Poems While You Wait. When Eric emailed me back, “Ruts,” I thought, Poor Eric, he’s in a rut. I’m going to write him right out of his rut! Because of your first question, it now occurs to me that Eric thought I was in a rut, and so he set me up to write my own pep talk poem. In either case, “it is okay.” The poem exists. This entry was posted in Behind the Sestina and tagged Behind the Sestina, blookslut, elizabeth hildreth, in a rut, McSweeney's, poem, Poetry, project runway, Sestina, The Incredible Sestina Anthology, top chef. Bookmark the permalink.